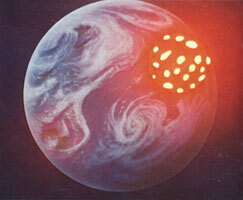 It is perhaps inevitable that great interstellar civilizations would sometimes make war upon one another. Despite the underlying desire for peace, the majority of first contacts tended to result in wars. When two civilizations met, the resulting conflicts were not caused merely by misunderstanding, but usually by the desire to expand their own empire’s territorial borders and natural resources, which was a common trait of aggressive civilizations. By contrast, the wars fought by the Terrans were either for their independence or self-defense. Among the worlds within the Milky Way, the greatest battles were fought between the Bolar Union and the Galman and Gamilas forces. What began in the Milky Way’s galactic core later spread outward, rapidly involving other star systems. As each side made alliances with friendly star systems, they combined their military might and laid the groundwork for a major Galactic War. Although this was not the typical expansion scenario of warfare, it was the first war in which the Terrans had to fight an alien race. The Gamilas wanted to destroy the Terrans so they could live on the Earth, since their own world was dying. There was not enough room for both civilizations to share the planet, and the Gamilas didn’t want to become second class citizens. The invasion of Earth looked successful at first, but with the aid of the Iscandarians, the Terrans were able to turn the tables, and the Yamato ended up hastening the collapse of the Gamilas homeworld. Fortunately for the Gamilas people, the Terrans didn’t want to rule over them. Because of this, several years later, they were able to forge a large empire in the Milky Way. 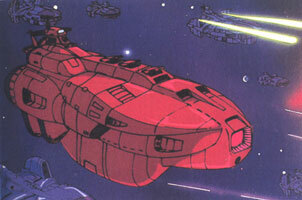 The entire focus of the White Comet Empire of Gatlantis was on the continuous path of their invasion. Those who did not bow before them were considered unfit to exist and were destroyed. Their life’s imperative was to invade and conquer. The concept of a life of cooperating with others was alien to them. Their path came to an abrupt end when they entered the Solar System and came up against the might of the Yamato and the mental powers of Teresa. This battle began with the Dark Nebula’s campaign to use the bodies of the Terrans. They had a special weapon that would destroy the mind but leave the host body undamaged. The plan was complicated when Emperor Skaldart, fearing the power of the Yamato‘s wave-motion energy, became obsessed with its capture. Ironically, this gave the Terrans a way to stop the invasion. When Terran civilization was completely subjugated, the Dark Nebula Empire planned to use human bodies as vehicles for reproduction, which prevented them from slaughtering humans en masse during the first attack. Of all the wars fought in the Milky Way, this was perhaps the most devious. 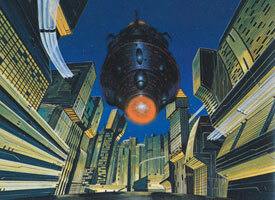 The Galmans had advanced Interstellar technology since their early days as a civilization. At their height, they had expanded out as far as the Large Magellanic Cloud. References to this had been passed down through the generations among the Gamilas people as well. However, as the Galman Empire waned, they lost control of their outer territories and were reduced to a few scant planets near their mother world. When the Bolar Union established itself, they conquered the Galman people and subjected them to severe living conditions. The scattered Galman colonies outside the Milky Way were nearly all destroyed, and only the Gamilas forces managed to survive and prosper. 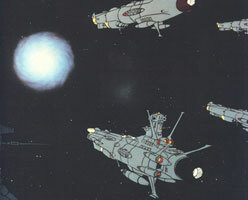 Dessler, leader of the Gamilas, eventually saved the Galman from complete destruction by freeing the mother world from the grip of the Bolar Union. As the Galman-Gamilas fought for their independence, the Bolar Union needed to squelch the uprising, and this led to a major Galactic War. The ever-expanding battles soon spread outward, in a mad grab by both sides to acquire territories. This resulted in the utter destruction of more than ten worlds, with the Bolar Union’s Planet Berth being the first casualty. 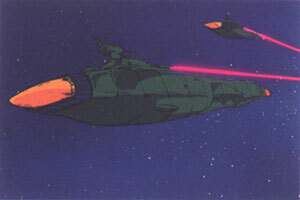 Both sides used Planet-Destroying and Warp Missiles in their arsenals, sending volley after volley until their objectives were achieved. 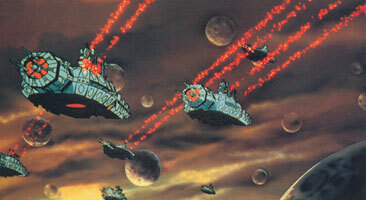 The Denguil battles were similar, if not worse, than the encounter with Gatlantis. Although most of their people died when the waters of Aquarius drowned their world, the remaining Denguil could have easily coexisted on Earth. However, they wanted instead to commit genocide by exterminating the entire Terran population. Since they had no intention of taking prisoners, their battle plans were particularly brutal and hinged on destroying everything in their path.